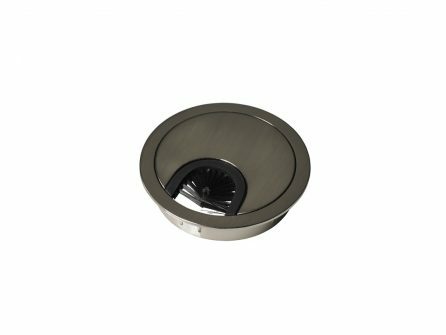 Cable outlet, brushed nickel available in size Ø 60 mm (or Ø 80 mm – click here) for fitting into a Ø 60 mm hole. Two part cable outlet made in metal (zamak), for press fitting or gluing into a Ø 60 mm hole. Perfect for organizing cables on offices tabletop or at the home office tabletop. Very easy to install, just drill the hole in the right sizes and mound the cable outlet into it. Turn the round part with the flexible brush one side and take it out. Put the cables etc. true the hole, refit the round part with the flexible brush and turn it to lock it again and then you are finish. Two part cable outlet in zamak for press fitting or gluing into a Ø 60 mm hole. Flexible brush seal. 1 pc. Two part cable outlet in metal (zamak), in brushed nickel. Cable outlet, brushed nickel available in two sizes for fitting into Ø 60 mm or Ø 80 mm holes. Two part cable outlet made in metal (zamak), for press fitting or gluing into either Ø 60 mm or Ø 80 mm holes. Perfect for organizing cables on offices tabletop or at the home office tabletop. Very easy to install, just drill the hole in the right sizes and mound the cable outlet into it. Turn the round part with the flexible brush one side and take it out. Put the cables etc. true the hole, refit the round part with the flexible brush and turn it to lock it again and then you are finish.